Difficulty: Advanced — AMEB A.Mus. A hymne to God the Father -- Death be not proud -- At the round earth's imagin'd corners -- Batter my heart, three person'd God. Score: Australian composers in song : vocal library. Score: Selected songs / by Australian composers. 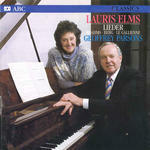 CD: Lieder / Lauris Elms, Geoffrey Parsons.